Figure 5.23. Student design team results in terms of orbital systems hardware. from orbit. As a first step the team determined that significant space facilities were necessary to achieve support of an initial infrastructure. As shown in Figure 5.23 there was a requirement for distributed facilities [Shekleton et al., 2002]. 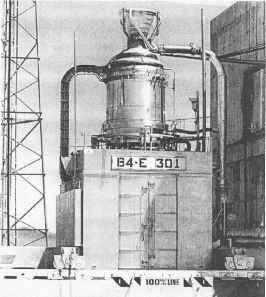 The primary facility was a twin propellant tank arrangement with living quarters, repair shop, and a parts storage straddling the two propellant tanks. A much larger, modified version of the elliptical Space Cruiser shown in Figure 5.26, was the primary OMV. The elliptical cross-section hypersonic glider was modified to a captured shock cross-section (wave-rider) based on the work of Mark J. Lewis of the University of Maryland [Lewis, 2002]. The OMVs were deployed from the service facilities on an as-needed basis for non-routine maintenance and repair, and on a scheduled basis for operational satellites and facilities. The gliders have limited facilities as habitats but have sufficient provisions for 3- to 5-day deployments away from the main service facility. The space station was not chosen as a support base because of the large quantity of propellant stored and the large inventory of spare parts and repair facilities required. One of the service facilities could be in orbital proximity to the space station if that was operationally required. 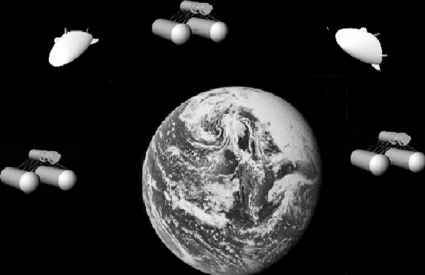 The propellant storage would accommodate about 100 tons of propellant or up to five propellant tanker payloads. The propellant tanks were segregated to accommodate hypergolic and hydrogen/ oxygen propellants separately. The hypersonic gliders were capable of escape and rescue missions for up to 15 persons. This constellation was considered the foundations on which to build an operational space infrastructure.